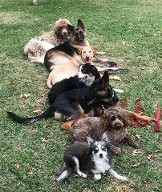 The Advanced Class is offered to dogs 1 year of age and older that already know their basic and intermediate commands. You and your dog’s attendance in this course can be for many different reasons. Firstly, because you have a really smart dog or secondly, you’re lifestyle would greatly benefit from a dog that you can control without a leash. If you and your dog did not graduate LISA’S classes, LISA will first administer an evaluation of your dog’s abilities at no cost, to determine whether your dog is ready for this course. Owners are welcome to continue attending Group Classes after the 6 week course concludes for a nominal charge. 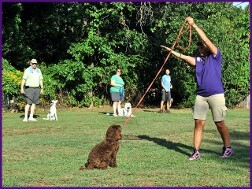 LISA enjoys seeing owners and their dogs continue Classes after graduation simply because they enjoy this quality time.